The Beulah Project is potted; rooted in the dirt of the common man-woman to give rise to something better in the coming days. "Helping People and Communities Reach Their Highest Potential." Established to honor the memory of Sadie Beulah McLean Allen (1920 - 2004), mother, missionary and charitable giver. The Beulah Project, Inc.'s mission is to empower people and communities through health education, the arts, media and law. 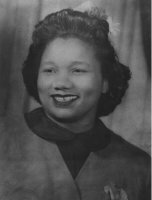 Born in Parkton, N.C. in 1920, Sadie Beulah McLean Allen's life was a testament to perseverance and faith. Although her dreams were often put on hold or never realized, Allen's dedication to raising her family, her encouraging nature, and anonymous giving assisted countless others in pursuing and accomplishing their goals. Therefore, with that spirit in mind, The Beulah Project is dedicated to creating and sustaining projects that empower people and communities as they strive to reach their highest potential. The Beulah Project is a 501 (c)(3) tax exempt charitable organization. "Mother, Missionary and Charitable Giver"
​Click on the video above for more information about the Beulah Project's mission and projects.